It’s been four years and four months since we left Australia and moved back to Alberta. There’s not a day that goes by when something doesn’t remind me of the life that we had there; the sessions with friends and their barbecues; the good times. When temperatures begin to cool here in Canada I know that things are just starting to heat up on the opposite side of the world. Sometimes, when our Canadian winters begin to feel like they will last forever, I wonder why we ever left our Perth home. 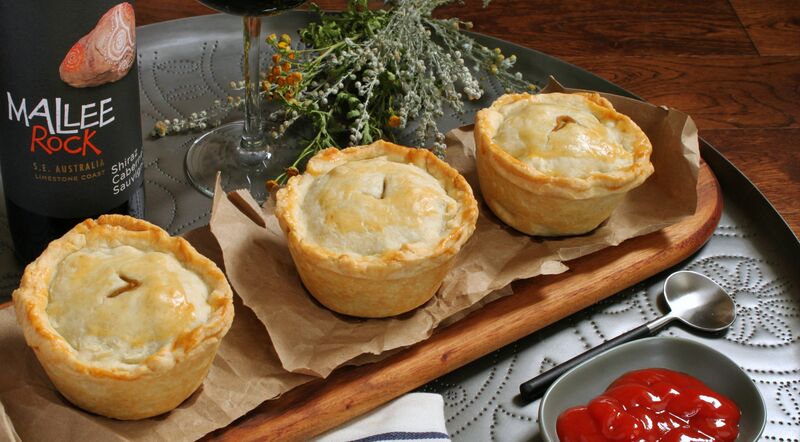 I cook special treats like Aussie meat pies and chiko rolls that remind us of warmer days when we would bring dinner and a bottle of Aussie red to the beach and stay to watch the sun set over the Indian Ocean. 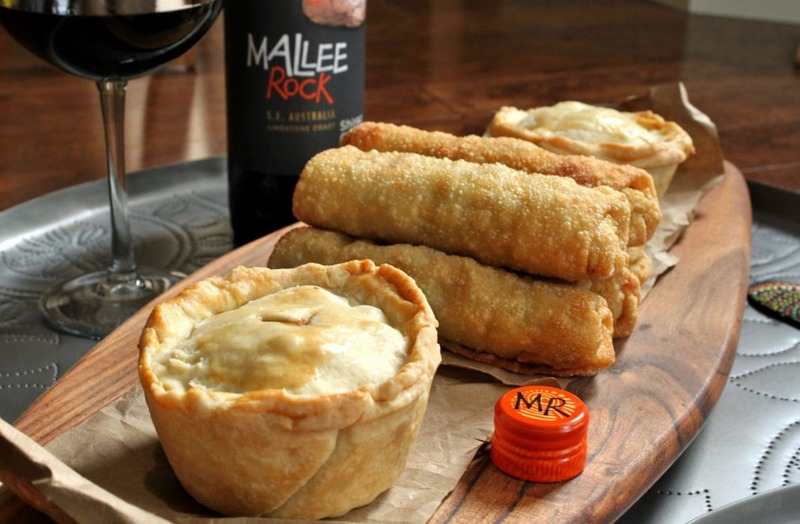 When I was asked to promote Mallee Rock Wines recent launch in Canada with some recipes created by Aussie-born Chef Todd Bright I jumped at the chance. Though I’ve made some great Aussie pies in the past, I’ve never attempted chiko rolls at home. It turned out that this Aussie feast, complete with Mallee Rock Shiraz-Cabernet Sauvignon was the perfect after footy (grid iron, not Aussie rules) dinner that we enjoyed out on our deck in the dying sun. It wasn’t the beach, but it was close enough. OR make your own pastry from here. Heat oil in a large pan over medium-high heat. Once hot, add onion, garlic and spices, and cook until onions are translucent. Add beef and bacon and cook until brown, making sure that any large clumps have been broken down. Add peas, gravy powder (flour) and stock and let simmer for about 7 minutes, or until a thick sauce has been made. Let cool. While waiting for the filling to cool, roll out the puff pastry and cut into rounds a little bit bigger than the tart shells (the pastry will shrink as it cooks). Place the tart shells on a non-stick cookie sheet and fill with the meat mixture. Place puff pastry rounds on top and brush it with a little egg wash. Bake for about 20 minutes, or until the top has puffed up and turned golden brown. 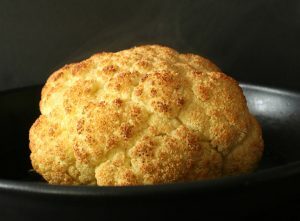 Take out of the oven and let sit for 5 minutes before serving (this will ensure the gravy settles and isn’t too hot). If your egg rolls wrappers are frozen, make sure that you have pulled them from the freezer a few hours before assembling the recipe. 2. In a non-stick skillet, cook the lamb or beef in 1 tbsp. of oil until browned and crumbly. Lamb adds more flavour to the roll, but beef is a good substitute. 3. In another pan, melt the butter on gentle heat and add the onion, carrot, cabbage, green onions, and celery and cook until softened. Add salt and pepper to the mix until it tastes good. Add the beef, couscous, brown sugar, curry powder, and cornstarch and cook for another 3 minutes. 5. Lay out 1 sheet of pastry. Place about 4 tbsp. of mixture a quarter of the way into the wrapper forming a log shape. Cover extra wrappers and Chiko Rolls with a damp cloth to stop them from drying out and cracking. 6. Tuck the left and right side over the mixture, brush with egg and roll the Chiko Roll up from bottom to top keeping it quite tight. 7. Heat the canola oil in a pot on the stove until the temperature is 300F. Blanch the rolls in the oil for about 7 minutes (at this point we don’t want any colour on the rolls). Remove the rolls from the oil and let rest for a few minutes while the oil reaches a temperature of 350F. Place the rolls back in the oil and cook until golden brown. Alternatively, reheat in an oven at 400F for about 12 minutes until brown. Well done Bernice 😋. They look delicious! Wow…what a great opportunity. 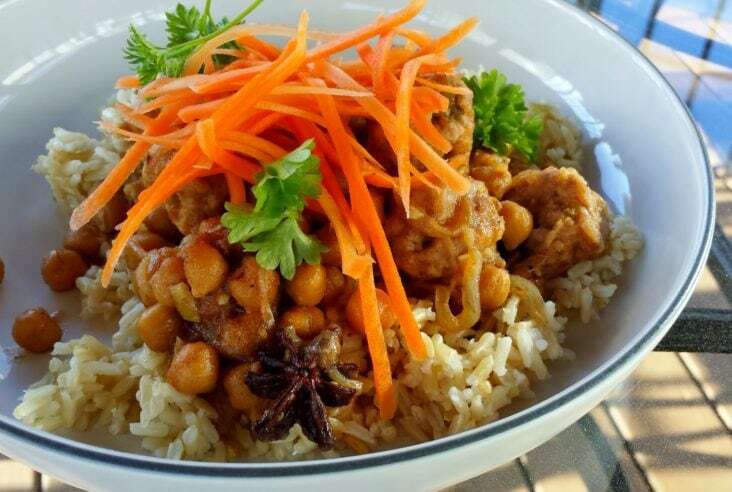 The recipes sound wonderful…and your pictures are great. Makes me want to dig in!! I would love to go to Australia … and meet/see Curtis Stone (one of my fav celeb chefs). Will print and make these this fall/winter…thanks!! I had to re-read your bio because I forgot that you’d lived in Australia. What a lovely country – that and New Zealand are definitely on my bucket list! 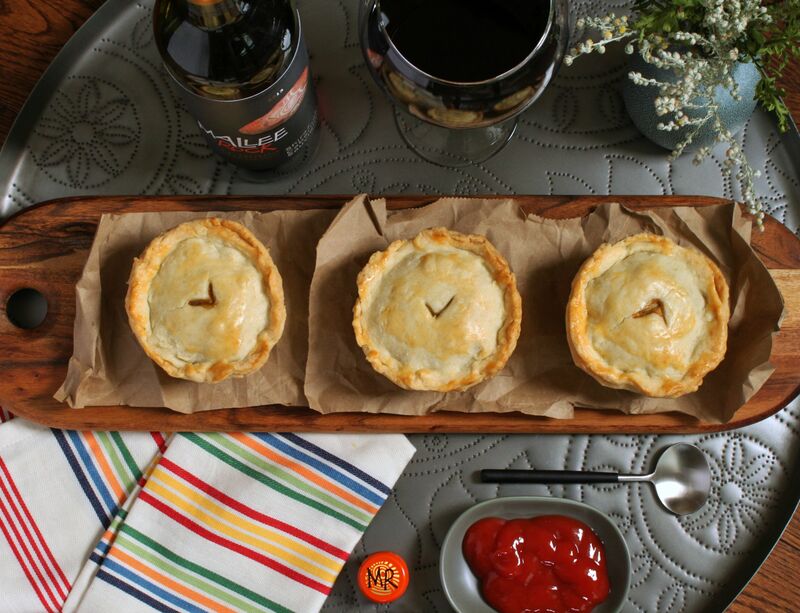 Love your meat pies – and great photos! When you go make sure you have a lot of time to savour!